In my painting for Simbi I used the old Roman crucifix for symbolism of God. Vodou is called evil and satanic by popular opinion, but truth is, the Vodou lwa come from God. All energy, all life and all spirits are only possible through God. Without Bon Dieu, there is nothing! Simbi Dlo is Simbi of the water and Andezo is Simbi in two waters. You can find Simbi Dlo in springs, streams, any fresh body of water, he will be there. Simbi Andezo loves salt water and fresh water. The cycle of water in nature is Andezo’s main focus but he is also a powerful magician like Simbi Makaya. Simbi Andezo is a good friend of Ogoun Feray, they are comrades. These spirits are only a small part of a huge family with many, many different Simbi lwa. If one makes a ritual for Simbi and soon afterward rain comes, this is a good sign from Papa Simbi! The Simbi spirits are all Petro lwa, they hail from the Kongo, in Africa. Gran Simba is considered the mother of all Simbi lwa. When it rains, when it pours, look up into the Nimbus and think of Simbi! 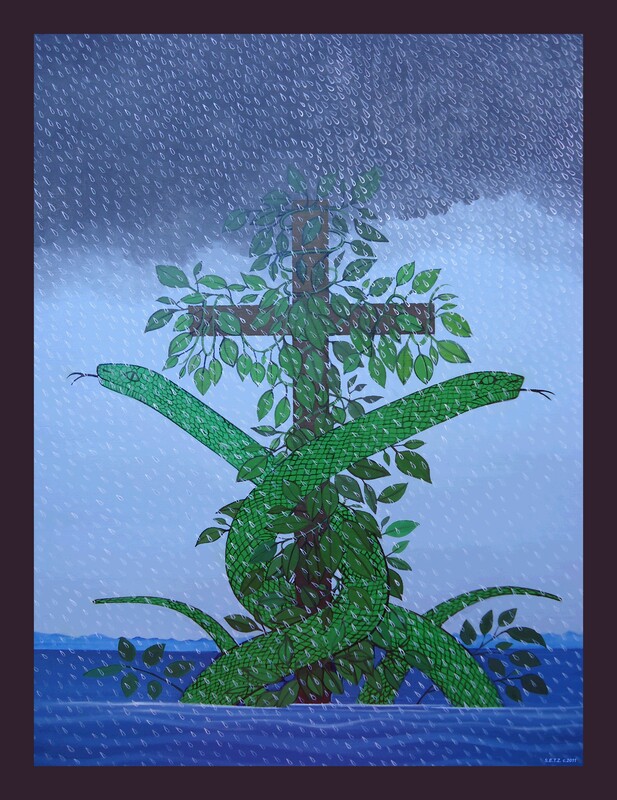 This entry was posted in Art for the lwa and tagged art, Art By Saundra Elise Ziyatdinova, creativity, cross, crosses, haiti, nimbostratus, nimbostratus clouds, nimbus, oil painting, painting, rain, religion, religious art, serpent, simbi, simbi andezo, simbi dlo, snake, spirit, vodou, voodoo. Bookmark the permalink. I love this painting. Part of the reason is the scales on the snakes, another reason is the individual drops of water. But the main reason is that it is powerful and moves me on a deeper level that I can’t really define. Hi there! Thanks Cheshire! I always loved the rain! My favorite weather is when the clouds are light to medium blue-ish gray with light rain. I have a relative from the country who used to create wallets and belts from real snake skin. I had to find the teeny tiniest detail brushes I could to get the water droplets just right! Beautiful blog and I am amazed by the art and what I am learning :D. I love the Evanescene tune, excellant! The rules are to share them with some bloggers. If you have previouly received more than one award you may add it to your list. If you do not accept awards, that is fine too, no problem. Nonetheless, I appreciate blogging with you and think you are worthy of these and more. Keep up the good work! Hello Raven! Thank you very much for the award! I truly appreciate it! I was also given the stylish blogger award by Cheshire of the Hermit’s Journey blog, he ‘s great! Evanescence is a great rock band one of my favorites, because Amy Lee has a beautiful voice! Thanks again!